The island has been known since prehistoric times with the name of Hydroussa, due to the running waters and water springs which exist to date. Ruins of the ancient city of the early Cycladic civilization, which influenced the Minoic and Mycenaean civilizations, can be seen in very good condition in Karthea. 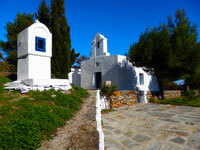 Due to the water which exists in abundance on the island, in contrast with other Cycladic islands, the main activity of the island's residents were agriculture and stock raising, as opposed to fishing. That is why you will find many local livestock products of excellent quality, such as beef meat, cold cuts, etc. The thyme honey of Kea is of excellent quality. The island is wooded with acorn trees, a tree variety which is unique in Europe. The produce of the acorn tree is used to produce local cookies, which are worth a try. The capital of the island is Ioulis, 5.5 km from Korissia, built amphitheatrically on the mountain, thus protected from the pirate raids. It is considered the only capital of a Cycladic island without streets for cars. It gives the impression that from its highest point you can get to the lowest by jumping from roof top to roof top. Wander around the labyrinth of narrow streets with whitewashed walls and courtyards with basil and geranium plants. Visit the Archaeological Museum with exhibits of huge archaeological importance. Do not miss out on the Lion of Kea which overlooks the town like a guard.Numerous taverns with traditional recipes, cafes and bars will help you quench your thirst and satisfy your hunger after your "mountaineering" experience of Ioulis. Enjoy the sunset overlooking the coasts of Attiki and Evoia and the endless blue of the Aegean. Gialiskari: 1200 m from Stavento House. A beautiful sandy beach with blue green waters. You can even visit it on foot from Stavento House. Moving away from Gialiskari you will find Vourkari after 500 m. Numerous cafes and taverns are to be found along the marina where yachts and sailing boats moor. Vourkari is famous for its night life. Otzias: 5.5 km away from Stavento House, on the northwestern side of the island you can find Otzias. A beautiful beach where you can enjoy swimming and have an ouzo in one of the taverns in the area. Spathi: 17 km away from Stavento House (of which the last 5 km are dirt road), on the north eastern side of the island you will find Spathi. It is protected by the northern winds, and is perhaps the most famous beach of the island with its clear blue waters. On the way to Spathi you will meet the monastery of PanagiaKastriani which is worth visiting. 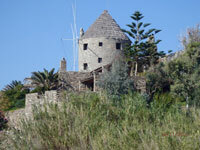 It is built on top of a hill overlooking the beautiful scenery and the neighboring islands in the Aegean. Sykamia: 16 km away from Stavento House (of which the last 5 km are dirt road), on the eastern side of the island you will find Sykamia. You will truly enjoy its emerald waters. On the way to Sykamia, 1.5 km to the north, you will find Kalidonyhi, a beautiful small beach you can visit. Liparo - Kambi: The southern beaches of the island, 30 km away from Stavento House. You can visit them and enjoy your swim when the winds come from the north. Koundouros: On the northwestern side of the island, 22 km away from Stavento House you will find Koundouros, the most cosmopolitan beach of the island, which is fully organised, and where you can enjoy swimming and sea sports, diving etc. Poisses: in the midwestern side of the island, 17 km away from Stavento House. A beautiful sandy beach, maybe the largest on the island, organized, with taverns and many trees. Xyla: A beach on the western side of the island, 5 km away from Stavento House. One of the most beautiful beaches of the island that can only be reached by dirt road. The beauty of the scenery will reward you. On the way to Xyla you will meet another small beautiful beach, Marades. Finally, if you have the time and desire there are many more small beaches to discover, coves along the island's coast. On the island you will find many mapped paths for those who love trekking. You will pass through green ravines and mountain tops with running waters and water springs, you will meet innumerable picturesque chapels of which some date from the pro-byzantine times and are of particular historic value. A path of particular natural beauty is only 2 km away from Stavento House, on the main road which links Korissia to Ioulis. You will trek through a green ravine with water mills reaching Fléa with the running waters, during the entire year. You can visit the Museum of Folklore on the island, and get to know more on local culture. Additionally, you can relax enjoying coffee or drinks in an idyllic environment.